But we need to make this distinction if we want to understand why herbivores might be naturally more prevalent in some places than others, and to measure true human-related depletion effects accurately. More specifically, in this study we wanted to know whether it was reasonable to expect the same amount of these fishes in areas where environmental conditions are very different. All herbivorous fish are not equal. Depending on what they eat, they perform different roles that contribute to the functioning of coral reefs, much in the same way that lawn mowers and hedge trimmers perform different tasks in your garden. To understand how these fishes differ in their response to the environment, we classified fishes in our study based on their functional roles, defined by what they eat and how they eat it. For example, browsers eat fleshy seaweeds; detritivores comb algal turfs, feeding on a variety of fine plant and animal matter; and scrapers and excavators scrape hard surfaces on the reef, clearing space for corals to colonize. Large excavators, such as big parrotfish, are considered to be particularly important. Which conditions suit which herbivores? We used a large-scale ecosystem monitoring data set of underwater visual surveys that were conducted by SCUBA divers for the Pacific Reef Assessment and Monitoring Program at over 3,000 sites at 33 islands and atolls in Hawaii, Central Polynesia and the tropical Northwest Pacific. These sites encompassed a wide range of physical conditions and levels of human population. By pairing data collected by divers on coral reef fish populations at these sites with satellite-derived data on factors such as sea surface temperature, we were able to separate the relative influence of humans from that of physical and environmental drivers on the biomass of different functional groups of herbivorous fish. Biomass is a measure that includes both the abundance and size of these fish. We modeled biomass because it is sensitive to fishing pressure and conveys information on the state of these functional groups. Human impacts on herbivores were clearly evident in this study. As human population density increased, the total biomass of all types of herbivorous fish on nearby coral reefs declined rapidly. We also found that this was true for some of our subgroups: Locations with more people had fewer browsers and large excavators. These species tend to grow to large sizes and live relatively longer than other herbivores, so they are both more heavily targeted and more vulnerable to fishing. Summary of the main results from this analysis. E = large excavating parrotfishes, B = browsers, D = detritivores. However, for several of the other groups we studied, environmental conditions influenced their biomass more strongly than human impacts. In areas with higher sea surface temperatures, browsing fishes were less common and detrivores were more prevalent. Additionally, browsers and large excavators were 24 to 45 percent more abundant on reefs around low-lying islands and atolls than on reefs near high islands. Since the groups of herbivores we studied play different functional roles on reefs, healthy reefs are likely to need diverse populations of grazing fishes. Browsers and large parrotfish are most sensitive to human impacts, so our results suggest that we may need new strategies to protect these species. Our findings also show that a coral reef's environmental setting strongly influences the number and diversity of herbivorous caretaker species that it can support. For instance, browsers that feed directly on macroalgae are naturally increased in cooler locations, while detritivores that selectively remove detritus from algal turfs (thus keeping the turfs clean) have increased population sizes in warmer areas. Agencies that manage coral reefs are increasingly turning to local-scale interventions to help make these sensitive ecosystems more sustainable. 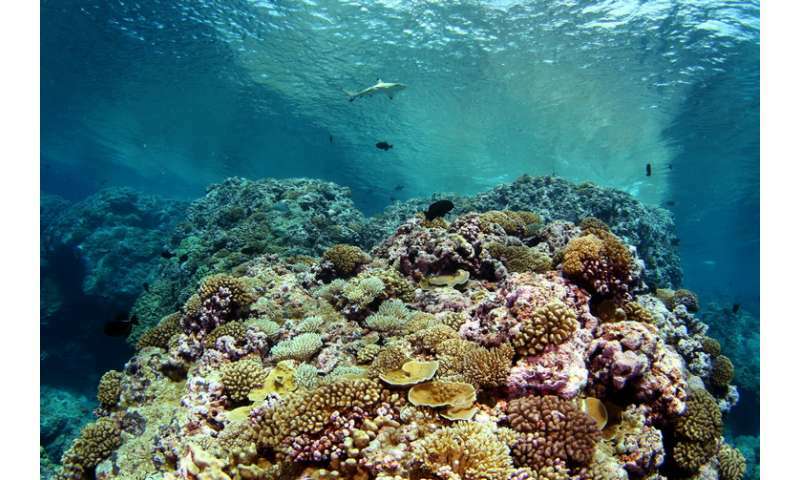 Some may adopt policies that focus on herbivores, such as the marine reserve on the Hawaiian island of Maui where herbivores, but not other species, are protected from fishing. Our results show that it is important to treat herbivores as a diverse group with different roles and vulnerabilities, and to think about the environmental context as we design strategies to protect them.